The Sonoma-Marin Fair event spotlights the huggiest hounds around. The Sonoma-Marin Fair favorite spotlights the huggiest hounds around, like Munchkin, a past superstar at the world-famous competition. WHETHER YOU'RE AN EXTROVERT or not, there's one constant that surely weaves through your life, if you're lucky enough to live with a dog of exceeding charm. And it is this: Many people, hordes of people, really, will want to stop and chat with you about your extraordinary BFF. Of course, all hounds boast oodles of charisma and cute-a-tude and general want-to-be-near-them-ness, and that's another fact. But some pups? They're extra, beyond, and so splendid that you feel a song should be written in their honor, or a park named after them, or they should serve as the spokesdog for a new canine chow. 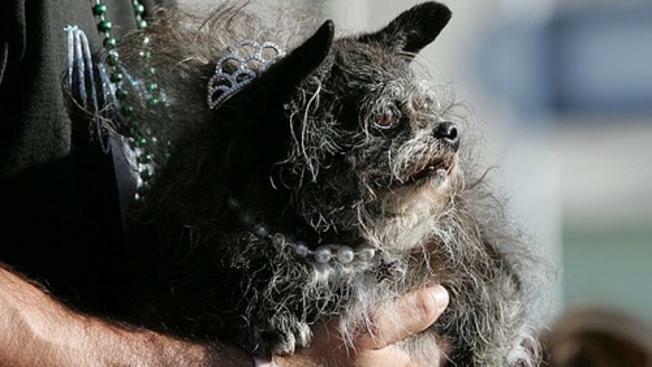 THESE FABULOUS FURRIES... are the same Fidos seen on stage, each and every year, at the world-famous World's Ugliest Dog contest at the Sonoma-Marin Fair in Petaluma. The puply participants might be missing a few teeth, or perhaps they're extra snaggly, or maybe all of their fur is bunched near their behind, leaving their legs distinctly hair-free. It's a competition that tenderly trumpets quite the important message, that celebrating our beloved besties, in all of their bunchy-hair, snaggle-fang'd glory, is a pleasure and an honor. REGISTRATION IS OPEN... for the 2018 event, which will arf arf on Saturday, June 23. The contest is at 6 in the evening, but there's a Pet Fest, too, romping from 2 to 8 o'clock. The grand prize is $1500 bucks, but "(t)he top 3 winners will receive a trophy, cash prize, and notoriety." The happening, which is presented by Pawscout, is very much about supporting adoption for all home-needing tail-waggers, regardless of their personal level of snaggle-tooth-o-sity. That's why the "... wonderful show of pageantry and pride" considers the "unique beauty" of each participant before deciding upon the huggable, cooable winners. BUT AT THIS CONTEST? Here's another true fact: They're all winners. They're well-loved, kissy-faced pups with humans who fawn over them, and deservedly so. Do you love your pooch a pawful lot? Love backing the important cause of animal adoption? Wednesday, June 20, 2018 is your last chance to enter.